NASA has been the figurehead of space travel in the United States for decades. Ever since the first missions, Gemini and Mercury, the space race, the Apollo missions, and more recently rovers on Mars, NASA has been the complete embodiment of space travel and the hope to reach farther than just our planet. At a robotics off-shoot from Carnegie Mellon University has designed a rover of their own. Designed to go to the moon, this rover will be able to stick it in for the long haul, doing that which the Apollo astronauts never could have done: survive the lunar night. Equipped with a bulk of solar panels, the Polaris rover is a prototype covered top to bottom in solar panels, so it can run as long as the sun hugs the horizon. The Polaris rover is unlike anything the extraterrestrial universe has seen before. Shooting for the moon might not seem so grand, but the rover’s main objective will be to search for ice caps at the moon’s poles. If suitable, the deposits could serve as a water source for lunar explorers or settlers. Not to underwhelm, the Polaris prototype has more under the hood. Polaris wields a drill capable of going a meter down. All this is impressive, but the software used to guide the rover was developed by NASA, and the rover’s build-team is looking to win big on a scholarship from them. 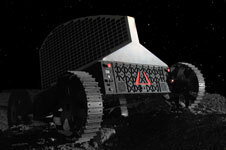 The big prize, though, is to be the winner of Google’s $20 million Lunar X prize. As a bonus, the winner will also receive a free ride from a SpaceX rocket. But what about NASA? Though they may not be launching the rockets or even designing all of the rovers nowadays, NASA still has the last word as the hub of space missions in the United States, and it’s safe to say that shouldn’t change for a long time. See more on the Polaris. It’s long been said that the cell phone is a danger to us all, but who believed it? A study by healthystuff.org shows just how each phone scored when looking for all of its chemical secrets. While it doesn’t prove the immediate danger of using a cell phone, it’s a least fun to see the comparison of how each phone scored when examined for its concentration of toxic chemicals. How much worse is your phone than the next guy’s? The study used phones from a variety of electronics manufacturers, so most phones are represented. The iPhone 4S and 5 were in the top 5 cleanest phones, but they also weren’t exactly free of all of the chemicals Apple claims they are. The cleanest phone was a Motorola, but before jumping to conclusions, you might want to note that the third most toxic phone was also Motorola. The trend appears to be that newer phones are generally less toxic–a welcomed change–with the Galaxy S III ranking in the cleaner phones. Check out the results for yourself. Posted on October 9, 2012, in Technology and tagged apollo astronauts, Apple, carnegie mellon university, gadgets, lunar explorers, Motorola, NASA, Phones, Polaris, Samsung, science, space, space exploration, Space X, technology, the Moon, toxicity. Bookmark the permalink. Leave a comment.